A Great Good Morning to you all! Grab your cups of coffee(ahh, is that a pun?) and get ready for a great challenge at Tuesday Morning Sketches. This is my 3rd week as Guest Designer and I've been having lots of fun with Melissa and her team. Melissa has a technique challenge for us this week and a wonderful sponsor Paper Pretties. If you're not familiar with Paper Pretties hop over for a browse around. There are some really cute digis and lots of other neat stuff to wet your supply whistles. As you can see by the title of my post the technique today is a diagonal pocket card. 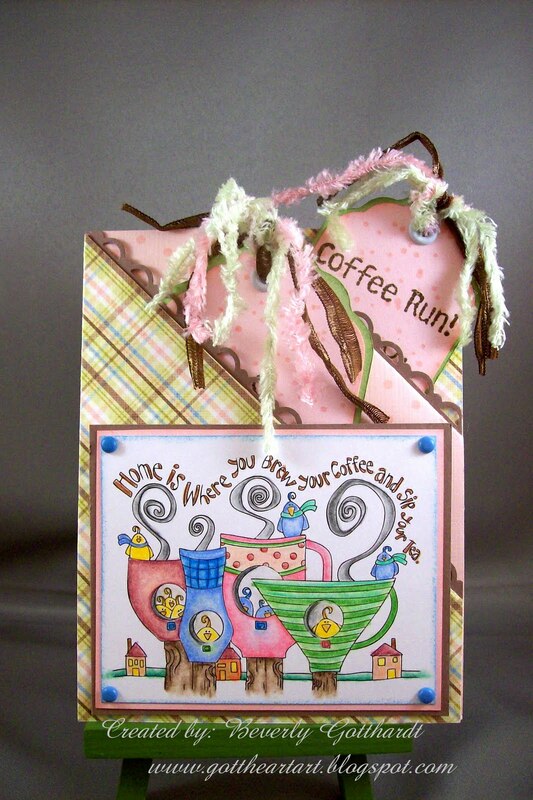 You can find the instructions and a video on Splitcoast Stampers. They are probably the premier go to place for instructions on all kinds of different techniques. Paper Pretties generously let our DT pick out some digis to work with this week. I couldn't resist these cute birdhouse cups and birdie residents. I broke out my PrismaColor Pencils and Sansodor Low Odour Solvent(just like gamsol) because I wanted to keep a soft feel to the image to go along with the softness of the color palette I chose. Be sure to pick a double sided piece of paper that you really like because the way you fold it both sides are revealed, I thought that was pretty cool. I found these soft funky fibers in my stash that just matched my color scheme and the little mini blue brads were the last little touch that just finishes things off. Hope my card inspires you to hop over to Tuesday Morning Sketches this week and give this challenge a try, but, if I haven't completely convinced you hop over and check out the other DT members cards and by the time you have left them some love on their blogs I'm sure you will have decided to jump in on this fun challenge. 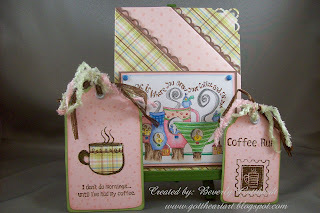 Supplies: Link for card instructions above, Papers: Chatterbos Inc-Olive Garden Plaid, Stampin Up-Close to Cocoa, Certainly Celery, Pink Pirouette, Stamps: Paper Pretties digi-Brew Your Coffee, TPC Studio-Coffee Cafe, Stampin Up-Itty Bitty Backgrounds, Ink: Stampin Up-Marina Mist, Blushing Bride, Soft Suede, Pear Pizzazz, Stampin Up marker- Soft Suede, PrismaColor Pencils, Sansodor Low Odour Solvent, Stampin Up-Scallop Trim corner and border punch, Crop-A-Dile, Jo-Ann's white eyelets, Fibers-CTMH-pink and green, brown unknown, mini brads unknown. Awesome spin on this technique! I especially like how you paper-pieced the coffee mug and the variation in tag size -- great details on a great creation!! Amazing!! I love how you put this together. It's simply stunning. I picked this image, too, but obviously I didn't play with it. 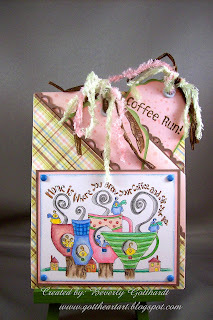 I love seeing it "done up" and your card turned out really adorable.